An impromptu sing-song by Cherie Blair to Chinese students has become a surprise dance hit among British clubbers in Ibiza and Cyprus. The prime minister's wife gave a karaoke rendition of The Beatles' hit When I'm 64 in Beijing last month. Her efforts have been remixed into a dance track, which is proving a hit in night clubs in Ibiza and Cyprus. Music experts predict it could storm the UK's pop charts. 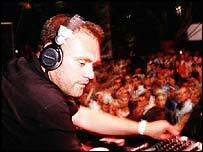 A spokesman for Radio 1 in Ibiza told the Independent newspaper: "The sample has serious novelty value. "It's a catchy tune and an eccentric performance. "When people realise it's Mrs Blair, it is difficult to know how they will react, but it is set to be red hot this summer." The Balearic island of Ibiza and the resort of Ayia Napa in Cyprus are at the forefront of the European dance scene. Popularity on the dance scene often leads to mainstream chart success. Cherie stepped in to help her husband Tony Blair when he was asked to sing by students in the Chinese capital. She sang one verse of the Beatles classic, which was reworked and then sent to key figures in the dance scene, the paper reports. One of Tony Blair's predecessors as party leader, Neil Kinnock, once made it into the music charts with a guest role in a Tracey Ullman video. But Cherie's musical adventure is entirely inadvertent. It is unclear whether she would be entitled to any royalties in the event of a chart success. Can the Cherie Blair remix make UK number one?